The subject of this drawing is Sydney’s Central Station. 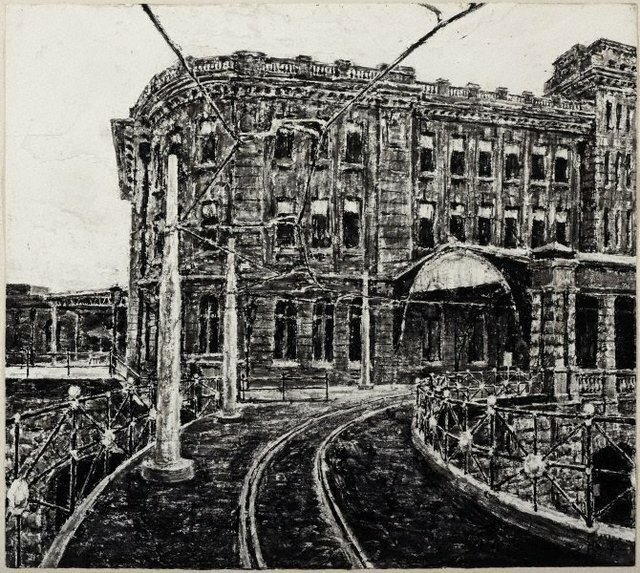 Harding began with photographs and rough ‘thumbnail’ sketches in order to develop the composition before embarking on the final drawing, in various tones of ink, in his studio. 'Two sheets of … paper are glued together using (an) adhesive. The machinepressed surface of the paper is too hard and resistant to absorption so I ‘skin’ it to reveal the soft stratum of paper beneath. Drawing commences using a square-tipped palette knife, emery cloth and a broken palette knife that operates both as a large square nib and as a correction tool. As the drawing progresses correction occurs by rubbing back through the drawing to reveal the white paper surface, ready to receive fresh mark-making and tone. Everything moves around until both a compositional tension and a synthesis of materials and content occurs.' (Nicholas Harding, 2001). This work won the Dobell Prize for Drawing in 2001 and was acquired by the Gallery in 2001.